BOXFORD, Mass. – Nov, 15, 2012 – Funkitron, Inc., an independent developer of hit casual games like Solitaire Kingdom® Supreme, Poker Superstars® and Slingo® Supreme (the #1 paid Casino app on the iPhone), today announced that their next fun game, Word Bird® Supreme, is now available for iPhone on the Apple App Store for $0.99. An HD version for iPad is also available for $0.99. 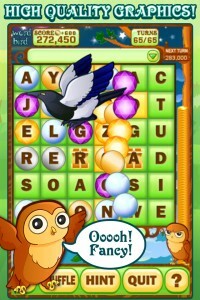 Word Bird Supreme is a new take on word games that is sure to delight casual and core game fans alike. Players have to make words to keep Hoo Hoo the baby owl happy and clear all the coins off the board, but take too long and the lurking Mr. Magpie may start stealing coins for himself. Quick play with short words means speed bonuses, but larger words mean multipliers for even more points! Players can also use 16 unlockable power-ups to create completely custom game variations of Word Bird Supreme and then test their skills against friends and family on Game Center. 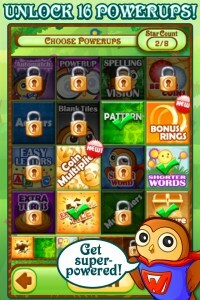 Word Bird Supreme for iPhone can be found on the App Store here. And Word Bird Supreme for iPad is available here. Funkitron is a leading designer, developer and publisher of casual video games: fun, easy-to-learn, captivating games that appeal to all ages across PC, mobile and other platforms. Based in Boxford, Massachusetts, Funkitron was founded in 2001, and has been going strong ever since. Funkitron’s games have been played by millions and millions of people and their top selling games include Slingo® Supreme, Slingo® Quest, Poker Superstars®, Solitaire Kingdom® and Trinklit® Supreme. © 2012 Funkitron, Inc. All Rights Reserved. Funkitron trademarks are the property of Funkitron, Inc. Slingo trademarks are the property of Slingo Inc. All other trademarks are the property of their respective owners. Check out the Word Bird Supreme trailer here. A digital press kit may be downloaded here.